Cabinet Solutions CNC is an easy-to-use software package for custom cabinet makers with CNC routers. Keeping with the tradition of ease-of-use, now cabinets drawn in Cabinet Solutions can be exported to our CNC Exporter where you can set up dadoes, hole patterns, and other types of operations. Drawer slide templates are available for Blum, Salice, Vitus, and more. The CNC exporter makes dovetail drawers easy. No need to measure your dovetail drawers in certain increments to make sure a dovetail gets cut off. 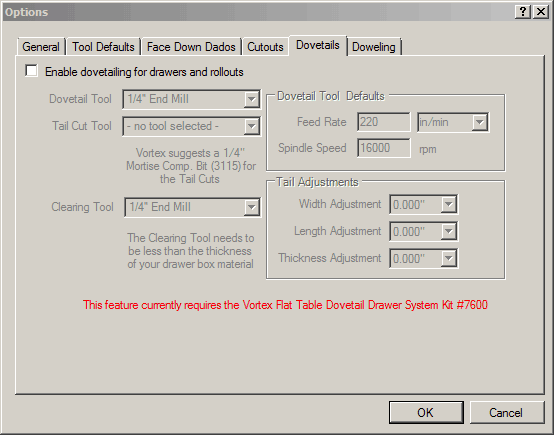 Our software can dovetail any size drawer box (only works with the Vortex Half Blind Dovetail Tooling kit #7600). The bits are indexable so you replace just the blades, not the entire bit. Starts at $600 per year. Advanced configurations (i.e. dedicated drill head/bank independent of the standard tool changer) have an additional $1000 one-time setup cost. Existing users of compatible versions of EnRoute with Automatic Tool Path can deduct that cost. All of the above options include unlimited tech support via phone & email and all software updates. Request more information about Cabinet Solutions CNC.